"Sometimes we forget the importance of one voice, of each of our voices, and the enormous difference it can make in all our lives�in history." 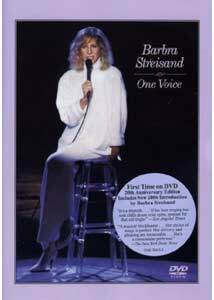 Back in 1986, years before her much ballyhooed comeback and farewell tours, it took a global crisis�literally�to inspire Barbra Streisand to sing in public. Nuclear proliferation was a hallmark of the Reagan administration, and its threat to humanity and nature so concerned Hollywood's foremost Democrat that she staged a $5,000-a-seat benefit in her Malibu backyard and raised her "one voice" in protest. HBO filmed the concert, attended by Streisand's closest friends (a mix of entertainment icons and Washington's most ardent liberals), and in the ensuing years, more than $7 million in proceeds have been donated to antinuclear, environmental, educational, and civil liberties charities. Not bad for a 60-minute recital. Although Streisand makes it difficult for audiences to separate politics from music, those who can will find the polarizing artist in top form in One Voice. Performing a mix of album and movie hits, along with a couple of songs new to her repertoire, Streisand takes full advantage of the comfortable, intimate surroundings and casts a hypnotic spell. Her impeccable artistry makes familiar tunes sound fresh, and her eloquent monologues�scripted though they may be�lend newfound depth to the lyrics of such songs as People and Papa, Can You Hear Me?. Some might find the political proselytizing disruptive, even off-putting, but Barbra wisely avoids a militant tone, and her simple statements about natural beauty and brotherhood resonate instead of annoy. Concerts usually do little more than celebrate an artist's gifts, so it's refreshing to view a performance that follows a relevant theme and allows us to reflect on larger issues. Streisand may be an egomaniac, but here she eagerly shares the spotlight with a cause that dwarfs even her considerable fame. Snippets of Robin Williams' warm-up monologue launch the program, along with brief comments from several arriving guests�Sally Field, Henry Winkler, Sheena Easton, Bette Midler, and Whitney Houston�all of whom rhapsodize over this "once-in-a-lifetime" opportunity to hear the legendary Barbra sing live. (Part of the concert's fun is trying to spot familiar faces�of which there are many�in the star-studded audience.) Very quickly, however, the focus shifts to Streisand, who opens with her space age arrangement of Somewhere from West Side Story. The lovely Evergreen follows, and begins a string of highlights that includes Something's Coming, the aforementioned People, and an especially beautiful rendition of Over the Rainbow�complete with verse�which she dedicates to the anthem's signature stylist, Judy Garland. Streisand has never seemed very comfortable "selling" songs, especially up-tempo pop tunes, and two duets with Guilty collaborator Barry Gibb exploit that weakness. (I'm a fan of Guilty, but the numbers depart from the evening's theme and seem anomalous choices in a predominantly classical show.) The concert's best moments come when Barbra stops the clunky hip-swinging and either stands or sits still, allowing us to hone in on the power and range of her amazing instrument. The tight camera angle on Send in the Clowns produces such an effect, and as a result, we fully appreciate the simple melody, probing lyric, and Streisand's pitch-perfect delivery. Her prayer for a better planet, It's A New World (another Garland original, from A Star Is Born), is sung with warmth and sincerity, as is her closing number, the patriotic America, The Beautiful, which she turns into an impassioned plea for political and natural awareness. But from a purely musical standpoint, the evening's best performance is without a doubt Happy Days Are Here Again, a song Streisand first tackled at the beginning of her career and one that has been associated with her ever since. The sublime Peter Matz arrangement suits her voice perfectly, and the contrast between the quiet first verse and soaring finish never fails to thrill. Though she will always trumpet worthy causes, dabble in directing, and strut across the screen, there's little doubt Barbra Streisand was born to sing, and One Voice showcases that God-given talent in its prime. Take the politics with a grain of salt, but enjoy the music straight up. Image Transfer Review: The original full-screen presentation has been nicely transferred to DVD, with fine clarity, crisp accents, and no print debris marring the image. Shot on videotape rather than film, the concert lacks the visual warmth and rich color celluloid provides. Black levels, however, are solid, and the Streisand's stark white outfit never bleeds into the background. Audio Transfer Review: Both a stereo and DD 5.1 track offer top quality sound, and make the concert so immediate, we often feel like one of Streisand's invited guests. The 5.1 option gently envelopes, and integrates just enough bass to add depth to the tonal field. Streisand's powerful vocals remain clear and distortion-free throughout, and in perfect balance with the orchestral arrangements. Extras Review: A 2006 introduction by Streisand runs less than two minutes, and doesn't even feature the star on camera. Instead, Barbra supplies a voiceover set to dull footage of technicians hooking up equipment on her Malibu estate. She draws parallels between the political climates of 1986 and today, hammers home the importance of last November's mid-term elections, and details the charities the Barbra Streisand Foundation supports. A few personal recollections of the concert itself would have softened the political message...and no doubt that's exactly why Streisand didn't include any. Though trimmed with partisan politics, One Voice is first and foremost a concert, and on that level it unequivocally succeeds. In superb form, Streisand croons many of her signature tunes, and the intimate atmosphere heightens the connection between singer, song, and audience. A must for Streisand fans and anyone who appreciates fine music.